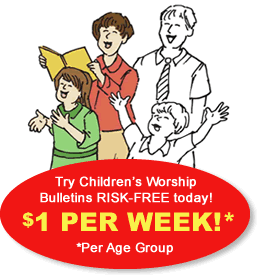 Children's Worship Bulletins have been professionally designed for two age groups: for ages 3-6 and ages 7-12. Bulletins for both age groups are filled with puzzles, codes, seek-and-finds, mazes, dot-to-dots, hidden pictures, word games and more. And it couldn't be easier to create fun and engaging Sunday school activities from our bulletins. In this short article, we'll look at two Sunday school bulletins about Jeremiah to show you just how easy it is! Sunday school activity about Jeremiah for ages 3-6: What had the people done wrong? Give each child a pencil and a bulletin. Explain the activity, "Look at the code at the top of the puzzle. The dots pictured look just like the dots on this die. Instead of solving the puzzle by filling in the missing letters in the order shown, we're going to roll this die and fill in the missing letters in the order of our rolls. If we roll a 6, we'll try to solve the puzzle without making another roll." Roll the die. If the first roll is 3, for example, have the children fill in the letter "w" throughout the puzzle (i.e., the first letter in rows two and three). Continue rolling the die until all of the blanks have been filled. At every roll of 6, ask the students to try to solve the puzzle even though it's unfinished. After solving the puzzle, read aloud Jeremiah 8:18-22 to reinforce the lesson. Sunday school activity about Jeremiah for ages 7-12: What did the letter say? Prepare for the class in advance by removing or covering the sign language code from the top of the puzzle. Give each child the modified bulletin and a pencil. Explain the activity, "We're going to use sign language to solve this puzzle. I will sign a letter and tell you which letter it represents. You will need to find the sign in the puzzle, and fill in the blank with the corresponding letter. Keep in mind that some letters appear in the puzzle more than once. You can try guessing the answer to the puzzle before I've given you all the signs. The first person to correctly solve the puzzle, wins." Following the sign language code of hand motions, make the sign for each letter of the alphabet, as shown, and tell the children what letter each sign represents. Continue providing signs and letters until someone wins. Read aloud Jeremiah 29:1-7 to reinforce the lesson. These two Sunday school bulletins about Jeremiah are just two examples of the hundreds of bulletins that are available in our library. Each quarter, all new material is added, including answer keys. With a nearly endless choice of lessons based on the familiar stories from the Old Testament, the Gospels and the Epistles, you'll never run out of ideas for your Sunday school class.